If Congress continues on its current path, students will be eating less healthy, and less often. 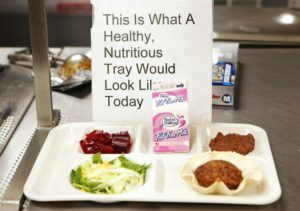 Republicans in the U.S. House are advancing a bill to alter the Child Nutrition and Education Act. The changes, proposed by Rep. Todd Rokita, R-Ind., would waive nutritional standards and raise the amount of poverty needed in a school before free meals are provided to students. The bill significantly weakens the Community Eligibility Provision that reduces administrative burdens and increases school lunch and breakfast access in high-poverty schools. Under existing law, schools can offer free meals to all students if at least 40 percent receive certain other types of government assistance. This is because when 40 percent of students are actively involved in assistance programs, an estimated two-thirds of students would qualify for free or reduced-price meals if household incomes were individually checked. Allowing schoolwide meals erases the paperwork burden on local administrators, who otherwise must verify each child individually. It also guarantees that all eligible students, even those whose parents wouldn’t go through the hassle of verification, are fed without stigma. The GOP proposal reverses that trend by dramatically increasing school meal application verification requirements, which will further isolate families already considered the most vulnerable — immigrants, homeless or those with English as a second language. If signed into law, roughly 7,000 schools nationwide no longer would be eligible for CEP. In addition, more than 11,000 schools expected to join the program no longer would have that opportunity. In Iowa, 531 schools across 179 districts have been identified as eligible or near eligible under current guidelines, meaning at least 30 percent of students are from low-income families. Under the Republican proposal, 438 of these schools would not meet the elevated eligibility threshold. Even students with the ability to pay for school lunches will be impacted by the proposal, since it also dismantles evidence-based school nutrition standards. Nevermind that Harvard University researchers said the standards are “one of the most important national obesity prevention policy achievements in recent decades,” or that the standards are estimated to prevent more than 2 million cases of childhood obesity and save up to $792 million in health care-related costs over 10 years. The GOP proposal brings back junk food that was eliminated as part of the Smart Snacks standards. It weakens the Fresh Fruit and Vegetable Program. As I’ve written previously, a healthy school lunch contributes to a child’s academic excellence. Studies confirm that students who skip or don’t receive an adequate lunch are distracted in the classroom. Persistent hunger or malnutrition from habitual undereating can interfere with normal physical and mental development. Nonetheless, a Republican-led House committee advanced the bill this week, paving the way for more hunger, stigma and government red tape. Wrongheaded policy is one thing; willful ignorance is quite another.